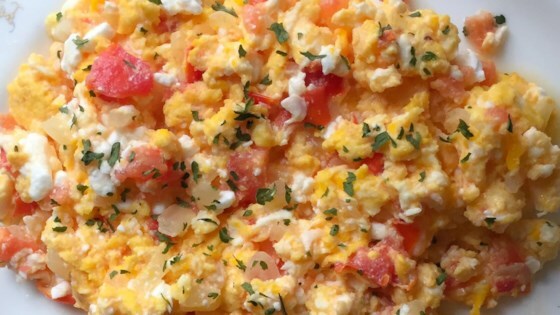 "A very TASTY way to add zip to boring scrambled eggs." Melt butter in a skillet over medium heat. Saute onions until translucent. Pour in eggs. Cook, stirring occasionally to scramble. When eggs appear almost done, stir in chopped tomatoes and feta cheese, and season with salt and pepper. Cook until cheese is melted. Didn't really care for the feta in my eggs. I'll stick to other cheeses. Wow! Had my doubts about this but was pleasantly surprised. Reduced the recipe using only two eggs but kept everything else the same. Great flavor. Went well with Canadian bacon. A yummy way to spruce up eggs, but more feta is needed to bring out the other flavors. We added garlic, which was a nice addition, but the overall product was a little bland. My favorite way to cook eggs. Doesn't need any added salt, the feta does it for you.